They were her creation meant for peace, but they became the empire’s weapons. They were her creation, but the empire’s weapon. 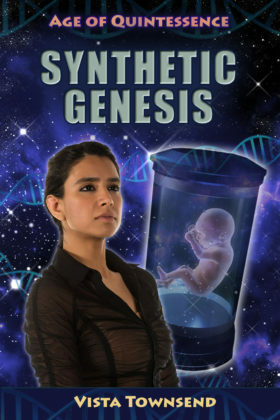 Humans have grown ambitious, creating genius children spliced with alien DNA, telling these unnatural offspring that they are destined to make the impossible possible. Layla never questions her elders. Young but determined, she works hard at her new genetic engineering job while secretly undertaking a project others consider insurmountable. She will create the perfect being—the quintessence of genetics. The resulting babies are captivating, yet their DNA holds dark, deadly secrets their creator had not planned for. Can Layla protect them from being pawns controlled by the company she works for? Can she protect her own heart from them? After all, property cannot love. With the Empire fractured by feuding factions, the fate of millions are intertwined with Layla’s choices, triggering the Age of Quintessence. Book 1 of the Age of Quintessence series.